Fortunately Don Kackman is hard at work at implementing the missing components in the HockeySDK as illustrated by the this pull request. We’ll have a look at utilising these changes in upcoming articles. Let’s start with a little bit about HockeyApp. In 2014, Microsoft acquired the company and positioned the tool as a core part of their solution framework for application distribution, crash reporting, user metrics and feedback collection. Up until that time there had been support for device apps in Application Insights but this year Microsoft announced their plans to transition all mobile and desktop applications to HockeyApp. This was met with some concerns in regards to feature parity between the two platforms and was addressed in this update from Microsoft. As of August, the HockeyApp Bridge was also delivered which allowed integration back to Application Insights and this is when I started to get excited. 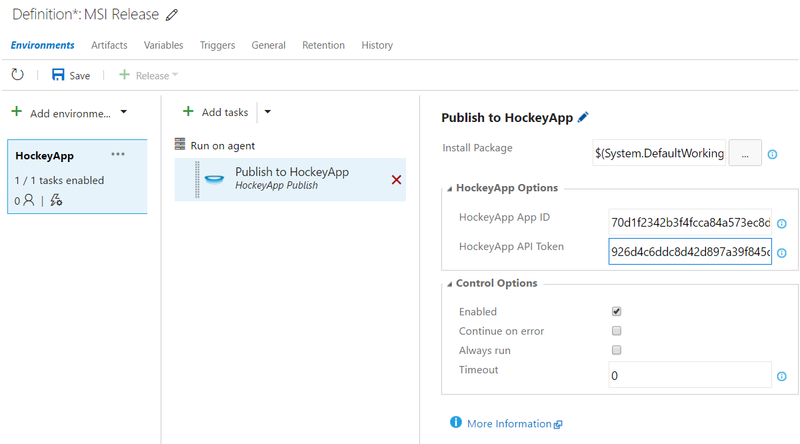 Create a VSTS build task to publish an MSI to a HockeyApp application. Use the HockeyApp REST services to download and install the published MSI via Powershell. Integrate the new WinForm support if available or update the SDK ourselves to publish custom events (telemetry) to HockeyApp. 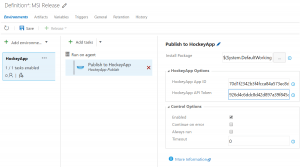 Demonstrate the HockeyApp to Application Insights bridge for surfacing telemetry retrieved from all installations of the application. Finally we will attempt to incorporate the application distribution functionality into the WinForms application itself. In a previous post I had created a node.js build task that was pretty close so I thought I may as well leverage that. I preferred to handle any compression as a build step rather than always created upload.zip. Having more control over the process was an advantage if I needed flexibility moving forward. Created a new version of the application in HockeyApp using the build number as the identifier. Uploads the first file found that matches the mask specified to HockeyApp against that newly created version. Refer to my post, From TeamCity to VSTS – My DevOps Journey – Part 2 for more information on creating custom build tasks in this fashion. Once published the build task can be added to a release and both the API token and App ID for HockeyApp specified. [syntax type=”html|php|js|css”]2016-11-10T05:27:53.1809456Z 2 downloads remaining. 2016-11-10T05:28:03.9447505Z 392 MB downloaded at 5254 KB/sec. Download time: 00:01:16.2506997. Parallel download limit: 4. The artifacts will now show as published in HockeyApp. The published version will also have a download page that will allow manual distribution of the release. With this process in place we have been able to automatically release a version for testing using the QA application on HockeyApp whenever a build is performed on our integration branch. After validation of the QA build the same set of artifacts can be released to the production application on HockeyApp for distribution to our customers. In further posts in this series I’ll show how we deployed the release we just published and how we can instrument the application to collect metrics from the deployed applications.